Tokyo 2020: Learning from Defeat and Redefining Tokyo’s Olympic Dream, 1952-1959. Joyous scenes following the award of the 1964 Olympic Games to Tokyo, May 1959. In October 2009, during the 121st Session of the International Olympic Committee, a vote was held to determine the Olympic host city for 2016. Tokyo was knocked out in the second round of voting, behind Madrid and, the eventual winners, Rio de Janeiro. The current Tokyo 2020 bid must effectively respond to, and learn from, this defeat if the capital is to overcome a renewed Madrid campaign and efforts by Istanbul to be awarded the right to host the 2020 Olympic Games. For lessons in how to bounce back from an unsuccessful bid campaign, Tokyo need look no further than the capital’s bids to host the 1960 and 1964 Olympic Games. This bid material, presented to the IOC in 1955, included Tokyo, a collection of photographs assembled by the Tokyo Metropolitan Government. Unfortunately, the collection included mainly non-Tokyo locations such as Nikko, Himeji and Mount Fuji. This suggested to the IOC members that post-war Tokyo lacked an urban identity. The sporting images used further undermined the bid, rather than promoting Tokyo’s thirst for international competition the compilation was dominated by sports unique to Japan. In the wake of war defeat, Japanese athletes had been suspended from participating in the Olympics, which limited the amount of relevant sporting material available to the campaign team. The voters were left unimpressed by the Olympic narrative presented by the City of Tokyo for the 1960 Olympics. Tokyo was eliminated in the first round of voting at the IOC Session in June 1955, generating the least number of votes of the seven competing cities. Rome was ultimately chosen to host the 1960 Games, the first step in rehabilitating axis powers that would see Tokyo host the Games in 1964 and Munich in 1972. In 1958, Tokyo’s Olympic fortunes would improve dramatically – the 54th IOC Session was set to be held in the Japanese capital to coincide with the 3rd Asian Games. This was seen as ‘an excellent time to acquaint the members of the IOC with Tokyo’s ability to manage an Olympic Games’ and the event was used as a platform to project a vision of Olympic Tokyo. 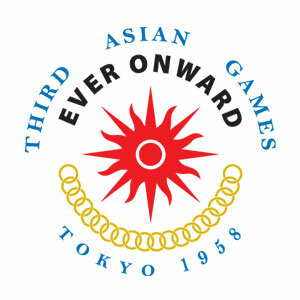 The 1958 Asian Games emblem. The Asian Games were held in Tokyo between the 24th May and 1st June 1958. The event allowed the reconstructed capital of Japan to be internationally showcased. Athletes from twenty countries participated under the patronage of the International Olympic Committee. Emperor Hirohito, absolved of wartime responsibility, officially opened the Asian Games and Crown Prince Akihito was patron. This, despite the fact the Asian Games hosted nations that had suffered at the hands of imperial aggression until 1945. The event was held at the newly completed National Stadium on the site of the former Meiji Shrine Outer Gardens, the favoured site for the 1940 Olympic Stadium. The stadium would later be enlarged in preparation for the 1964 Olympics. Symbolically, a torch relay was held for the first time in Asian Games history, to promote Olympism in Asia. The relay began at the site of the previous Asian Games, Manila, stopping in Okinawa, before arriving at Kagoshima for a relay to Tokyo. This route evoked wartime memories while seemingly attempting to define the boundaries of post-war Japan. Mikio Oda, the first Asian to win an individual Olympic Gold medal, ignited the ‘Sacred Flame’ in Tokyo. Oda represented Japan’s pre-war Olympic legacy and his presence united pre-war and post-war ambitions to achieve internationalism through athleticism. These Games would be remembered for the demonstration of Japanese athletic prowess as the team won sixty-seven gold medals. The Asian Games were proof that post-war Japan was capable of staging an international sporting event and it gave the visiting IOC members a clear vision of what Olympic Tokyo would be like. The vote to determine the Olympic host for 1964 was to be held the following year, at the IOC Session in Munich. Tokyo’s bid to host the 1964 Olympics was presented to the International Olympic Committee following the Asian Games. The bid material attempted to address the flaws of the previous campaign, mementos of the Asian Games and the IOC Session in Tokyo were also included. The planned location of Tokyo’s Olympic venues, and their surroundings, would have been acutely familiar to those who attended the 54th IOC Session and Asian Games. In contrast to the 1955 bid book, there were a series of images of international athletes – sprinters, gymnasts and basketball players. An image of the ‘Sacred Flame’ being lit by Oda at the National Stadium was also included, provoking thoughts of the Olympic flame burning brightly in the capital. One of the final images was a double page colour photograph of Tokyo at night, it featured the neon lights which would go on to become characteristic of modern Tokyo. The strength of public support for the bid was also emphasised, it is stated that ‘this current desire of Tokyo is whole-heartedly backed and supported by all segments of the entire Japanese nation.’ With regards to the current Tokyo 2020 bid, this is an aspect that needs to be constantly taken into account, low levels of public support contributed to the failure of the 2016 bid. By describing Tokyo as a victim of ‘unfortunate circumstances’ the issue of war responsibility is sidestepped. The 1940 Games were said to have been ‘cancelled’ rather than relinquished, which leaves the responsibility for this ‘cancellation’ open to interpretation. The fact that the city which was awarded the Olympics for 1940 was mostly destroyed in 1945 is also ignored. Nevertheless, at Munich, the vote was held to determine the host city for 1964. Once the candidate presentations had been given it was stated that ‘several delegates are definitively in favour of Tokyo.’ Out of 56 votes, Tokyo polled 34, leading Detroit (10), Vienna (9), and Brussels (5). The victory was made all the more satisfying as Tokyo had finished behind Brussels and Detroit just four years earlier, a turnaround that the Tokyo 2020 team hopes to replicate against Madrid this coming September. By emphatically awarding the Games to Tokyo, the IOC implied that they approved of Tokyo’s re-defined Olympic narrative, which had been showcased during the Asian Games and IOC Session. Yet, by rewarding a demonstration of Olympism, selecting Tokyo as the first Olympic host in Asia and accepting the emperor as a figurehead, the decision of 1958 displays considerable similarities to that of 1936. The outcome of the 2020 campaign could mirror the turn of fortunes seen in the 1950s, it may even coincide with an economic revival similar to the one that followed the 1964 Olympics – but only if Tokyo can demonstrate that lessons from the 2016 campaign have been learnt. Work must also be done to improve international relations in the East Asian region. The issue of war responsibility is as prominent as ever, international media have been closely following controversy surrounding ‘comfort women’, official visits to Yasukuni Shrine and lingering territorial disputes which have the potential to damage the Tokyo 2020 bid. There even could be regional opposition to the Tokyo bid if the capital’s pre-war Olympic connections, which are retained in the fabric of the 2020 bid, gain international attention. Despite this, Tokyo has a strong chance of defeating bids from Madrid and Istanbul due to the troubled financial situation in Spain and ongoing security concerns in the Middle East. S. Collins, ‘‘Samurai’ Politics: Japanese Cultural Identity in Global Sport – The Olympic Games as a Representational Strategy’, The International Journal of the History of Sport, 24, 3, (2007), 362. Bid to host the 1960 Summer Olympic Games, 1955, BOA/IOC/BID/S4, BOA Collection, University of East London, London, non-paginated. The Official Report of The Games of the XVIII Olympiad Tokyo 1964, v. 1, 35. ‘Third Asian Games, Tokyo 1958’, Bulletin du Comité International Olympique ( Olympic Review ), 1957 May No. 58, 65. ‘Extract of the minutes of the 55th session of the International Olympic Committee in Munich (Haus des Sportes) May 25th to May 28th 1959’, Bulletin du Comité International Olympique (Olympic Review), (August 1959) 67, 51-52.